Heath put their disappointing opening day defeat at Middlesbrough behind them with a convincing 32-5 home win over Selby in Yorkshire One yesterday. 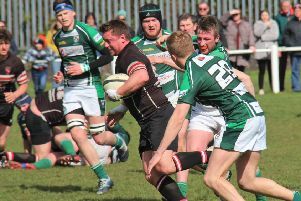 They ran in four tries to lift spirits ahead of next Saturday’s derby clash at Old Brodleians. Olly Cook and Dave Skinner were drafted into the starting line-up whilst Heath welcomed Jordan Moana back from injury on the bench alongside Michael Reynolds and Seiffe Boussadda. Selby put their hosts under early pressure but defended well and Dan Cole’s tremendous clearance found touch in the visitors’ 22. Heath had moved up a gear and a super burst of pace from Peter Birkett set up the next attack. Heath’s pack were beginning to dominate and Selby crumbled, giving away a penalty which Ezra Hinchliffe converted on 13 minutes. Full back Jack Crabtree also showed his kicking prowess and Hinchliffe increased the lead to 6-0 on 20 minutes with a second penalty. Heath mounted an onslaught lasting 16 phases and were awarded another penalty 10 metres from the try-line. They opted for a scrum and Selby could not prevent a push over try, Richard Brown emerging with the ball. Hinchliffe added the extras and Heath led 13-0 as half time approached. Boussadda and Moana came on and linked well with Alex McFadden and Chris Moore as Selby clung on before half time. Heath went on the attack from the re-start and Cole skipped over for an unconverted try and an 18-0 lead on 42 minutes. Boussadda and Moana were making inroads into the Selby defence and when they linked up in a move involving Cook and Callum Harriett-Brown ,the ball was swung across the field and Cole’s clever kick for the touch line just evaded the onrushing Eddie Cartwright. Fergus Marsden won plenty of line out ball throughout the game and from one take Heath put in a rolling maul and Selby were penalised. From the resulting scrum Moana popped the ball out to Peter Birkett, who scored. Hinchliffe’s goal made it 25-0 after 55 minutes. A planned move involving Cole, Hinchliffe and Harriett-Brown opened up a huge gap in the visitors’ defence. The winger was held up just short of the line but Moana backed up and scored the bonus point try. Hinchliffe added the extras. Selby never gave up and although they had been on the defensive for most of the game they managed a late consolation try. A strong looking Heath seconds won 26-12 at Selby.